This is the first narrative history of Broncos’ athletic program. Learn about the coaches and athletes who build championships over the years. 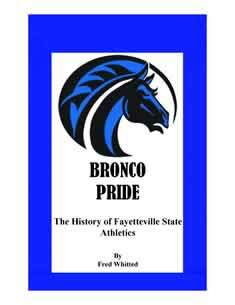 The Broncos became the most dominant golf program in the history of the CIAA. The women’s basketball program became one of the best in the nation. Lilly Gym became a premiere basketball venue. This book will be available August 17, 2015. Pre-sale begins July 29, 2015 $30.00 plus tax and shipping. A portion of the price goes to support FSU scholarships.